SINDHULI, March 22: After assembling workers and managing construction materials, survivors of the catastrophic earthquake of 2015 had just started rebuilding their houses in the district when scarcity of water stalled their dream to move to their new houses again. Various organizations made several pledges to make water taps and drinking water accessible in every home, but none of them have delivered their promises. Lack of rainwater and prolonged drought has led to water shortage in district headquarters Sindhulimadhi and many nearby villages. As the sources of water have started drying up, quake victims have been struggling to rebuild their houses. Indra Bahadur Bhandari, a local of Sunkoshi Rural Municipality-7, Majhuwa informed that the locals have been building their houses by turns. "At first we will let our neighbors built their house and then will start ours," said Bhandari, adding, "It will be difficult for us to manage water if we both construct together." As per the details publicized by the government, more than 34,000 houses in the district were destroyed or damaged by the earthquake. Thirty-four months after the earthquake, victims had just started building their houses but the unexpected shortage of water has compelled them to stall the construction after laying the foundation of their houses. "We are obliged to walk for three hours every day to fetch a jar of drinking water," said a local of Sunkoshi Rural Municipality-1, Dumja. 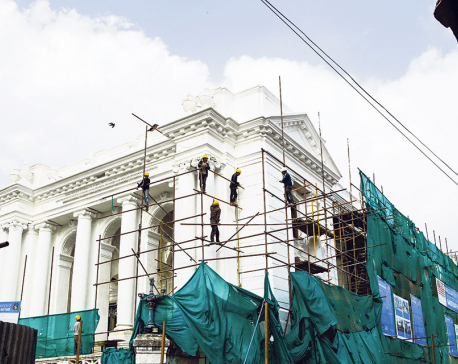 The government has instructed the victims to complete the construction by mid-July. But that seems like a far-fetched dream for many. There are enough taps and wells in Hatpate VDC but still, the locals have to walk three kilometers to manage drinking water for survival. After waking up in the morning, women of these villages gather in a place and jointly march toward Tallo Khuttepani to fetch water. This has been a regular routine for them. However, this is not the first time that locals have dealt with the scarcity of water as this happens every year. "At this time, one jug of water has been as precious as gold," said Anju Thapa of then Harshahi VDC. When locals are hardly able to cook their meal, managing water for construction is out of context.